Witchcraft is a tale of star-crossed lovers, kept apart by their warring families – and a vengeful witch. When her grave is disturbed by modern-day land developers, a 300-year-old witch is accidentally resurrected and terrorizes an English village. ﻿﻿ What do you get when you cross Romeo and Juliet with a vengeful witch and a dash of Lon Chaney Jr.? You get a surprisingly enjoyable horror movie titled Witchcraft. It’s well-done, with good acting all around, and a surprising change about midway through the story. In the 17th century, the Lanier family buried a Whitlock woman alive as a witch. And then took over the Whitlock estate. A bitter hatred of the Lanier family continues into the present. So, it’s understandable how the Whitlock family still holds a grudge over the Laniers. Lon Chaney Jr. plays Morgan Whitlock, a grumpy man with a chip on his shoulder towards the Laniers. Which becomes bigger when the Lanier brothers’ construction crew’s bulldozer overturns headstones and churns up graves in the old Whitlock Cemetery. It was against the Lanier’s wishes, but you can’t convince Morgan of that. In short, Witchcraft is a very well-done horror film, with characters that the audience cares about. And a tragic ending that you’ll have to see for yourself. 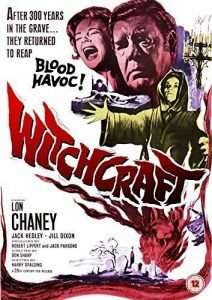 Starring the great Lon Chaney Jr in one of his last acting roles, Witchcraft is a superb British horror film, directed by Don Sharp (Curse of the Fly, Kiss of the Vampire, Callan). During the 17th Century, the Lanier family buried a Whitlock woman alive as a witch to take over the Whitlock estate. Despite a bitter hatred, two descendants of the warring Lanier and Whitlock families Amy (Diane Clare) and Todd (David Weston), decide to marry. But when Bill Lanier (Jack Hedley) begins to renovate the old Whitlock Estate, a bulldozer overturns headstones and churns up graves in the old Whitlock Cemetery. Rising from an open grave, the buried witch Vanessa Whitlock (Yvette Rees) searches out Morgan Whitlock (Lon Chaney Jr.) to use their witchcraft to murder the despised Laniers – one by one…. August 6, 2018 admin Horror movies David Weston, Diane Clare, Jack Hedley, Lon Chaney Jr.